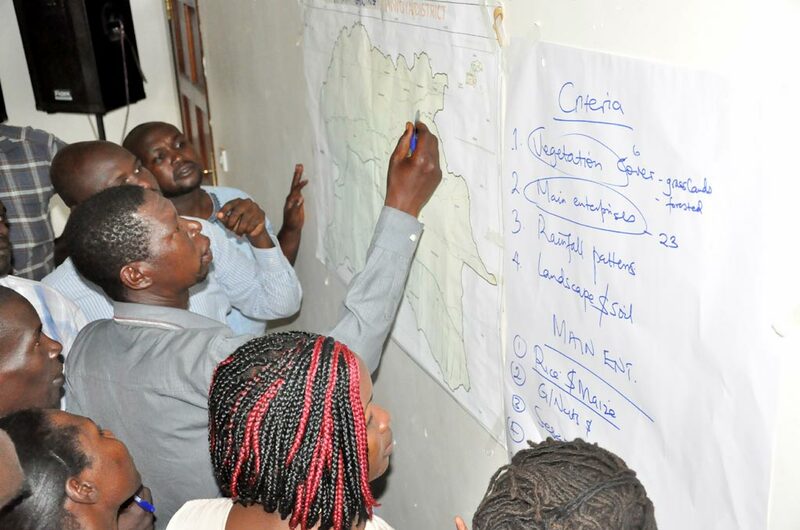 Participants planning for locally appropriate Climate Smart Agriculture options. Bwayo explained that Nwoya is very hot but when he goes to his hometown Mbale, it is the rains that affect the people there. He said this to emphasize the context-specific nature of climate change impacts that cannot be generalized but need specific and targeted planning to address. The two-day meeting was organized by Nwoya District Climate Change Learning Alliance spearheaded by Nwoya District Local Government with Support from the Policy Action for Climate Change Adaptation (PACCA) project. PACCA is an activity of the CGIAR Research Program on Climate Change, Agriculture and Food Security (CCAFS), which is implemented by IITA, the International Center for Tropical Agriculture (CIAT), the International Livestock Research Institute (ILRI), and local partners in Uganda and Tanzania. The Learning Alliance meeting was held on 17-18 May at the District Council Hall to plan for locally appropriate Climate Smart Agriculture options for the different agroecological zones in the district. Options given priority will be integrated into the district development plans. Bwayo told stakeholders that they were all affecting the environment and subsequently the climate in one way or another, and gave examples of stationery used in the workshop and meals cooked using firewood or charcoal from felled trees. He reiterated that it was important for people to work together to change the way they do things, particularly in reducing the impacts of climate change and emphasized the relevance of the district climate change learning alliance in this regard. Zonal planning approach. 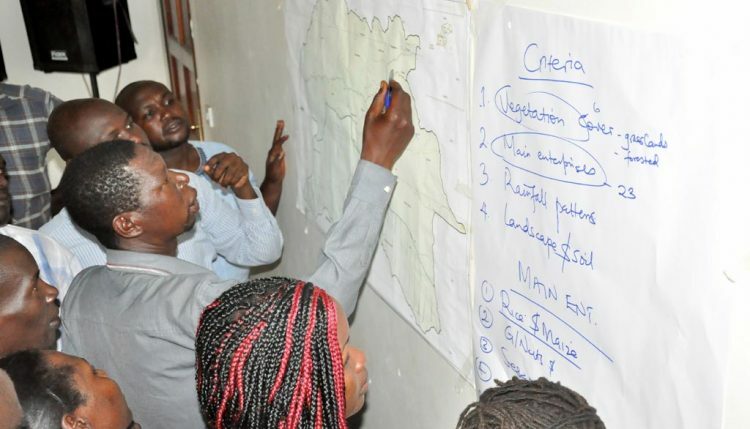 Stakeholders suggested key sources of livelihood or agriculture enterprises as the criteria for zoning Nwoya District and came up with four zones, namely: Banana & Coffee, Sesame, Rice & Maize, and National Park. Discussions were held in each zone to identify key enterprises, climatic effects on the enterprises, gender constraints at the household, farm, community, market, and policy levels, possible solutions, opportunities, and actions that would advance the enterprise. Other areas of discussion included the role of natural resources, policies, institutions, and norms that affect the enterprise, and actions to scale out the enterprise.